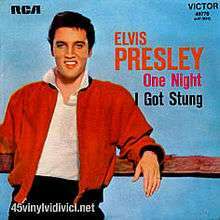 (1958) "One Night / I Got Stung"
(1958) "(Now and Then There's) A Fool Such as I" / "I Need Your Love Tonight"
"I Got Stung" is an upbeat, bouncy rock and roll song written by Aaron Schroeder and David Hill and performed by Elvis Presley, which was recorded and released in 1958. Clocking in at under two minutes, it features some of Elvis' most rapid-fire vocals alongside humorous and catchy lyrics, and was released as double A-side with "One Night", reaching No. 1 in the UK. Presley recorded this, his final song of the 1950s, on June 11, 1958, when he went to Nashville during his army stint, as he was preparing to set sail for Germany. It was one of a number of Elvis Presley songs to be re-released in the United Kingdom in 2005 and it went to No. 1 again, in a double A-side release with "One Night". 1 2 "I Got Stung - Elvis Presley - Song Info". Allmusic.com. Retrieved 19 January 2016. 1 2 "I Got Stung - Full Official Chart History". Official Charts Company. Official Charts Company. Retrieved 19 January 2016. 1 2 Rice, Jo (1982). The Guinness Book of 500 Number One Hits (1st ed.). Enfield, Middlesex: Guinness Superlatives Ltd. p. 41. ISBN 0-85112-250-7.